TeamGram can tell you how many qualified leads come from each of your lead sources. Combine that information with the money you spend on each lead source and compare their effectiveness. You will get leads as a result of your marketing activities. Marketing costs money, and you will want to allocate your budget wisely. A good measure of marketing efficiency is cost-per-qualified lead. You probably know your costs for each marketing channel, but you will also want to know how many qualified leads each of them bring in. To do that, you will want to keep track of the source of each lead. 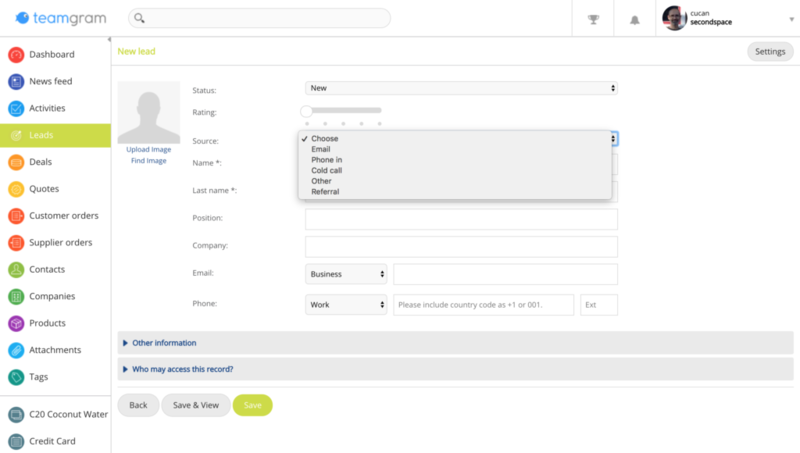 You can select the source of each lead in the source field. Typical lead sources can include online advertising campaigns, cold call campaigns, trade shows, etc. Your administrator can define the lead sources to be tracked by TeamGram using the control panel settings. Setting the source of a lead can help you understand how it was generated, and compile reports and charts that show how well each of your lead sources are performing.